Congrats on retirement and best of luck to Katie Cotton, one of the greats. Apple PR chief Katie Cotton retires. Guess I should stop waiting for her to return my call from 2001. “Impresario,” “powerful,” “transformative”: words tech reporters use to flatter PR gatekeepers. @kevinroose yeah iMac, iPod, iPhone, and iPad didn’t change the tech landscape at all. and who pays attention to apples media story, anyway? Katie Cotton, Greg Christie, Scott Forstall, John Browett, Ron Johnson, Bertrand Serlet, Tony Fadell, & Gray Powell should start a company. Back in July 2010, I was witness to one of Apple’s few true PR crises in recent history: iPhone 4 “Antennagate”. Apple, famously, works hard to control the narrative surrounding its product releases, and generally does so successfully. But the Antennagate story was spinning out of control: from “the iPhone 4 can lose signal strength if held in certain ways” to “the iPhone 4 can’t make phone calls and might need to be recalled”. It was nonsense, but needed to be refuted. Nipping this thing in the bud was important enough that Steve Jobs flew back early from a vacation in Hawaii. The event was held on a Friday, which itself is unusual. It was a “this thing can’t wait until Monday” situation — a fire that needed to be put out before it spread. Non-emergency press conferences are not held on Fridays. An Apple PR rep had been in contact with me a few days prior, to ask if I’d be interested and available for a possible press event later in the week. At the time, I was suffering from a lingering summer cold, which made the prospect of a transcontinental flight even less appealing than usual. But I’m no malingerer, and so though I mentioned my cold, I said I’d almost certainly be in shape to travel by the end of the week. This seemed like something I wouldn’t want to miss (and I was right). The press list for the event was unusually small — by far the least-attended Apple event I’ve ever witnessed. You can see in the video of the event that Apple’s on-campus Town Hall auditorium wasn’t nearly filled to capacity, and Town Hall is a relatively small venue. Every other Apple media event I’ve attended has been standing room only. I was wearing a large SLR camera on a strap around my neck. As I filed in to find a seat, I was offered a choice: if I wanted to take photos during the event, I could sit toward the back; if I were willing to forgo taking photos, I could sit up front in the third row. I only had my camera with me on a lark — the advantages of publishing a website that runs photographs only rarely — so I took the seat in the third row. 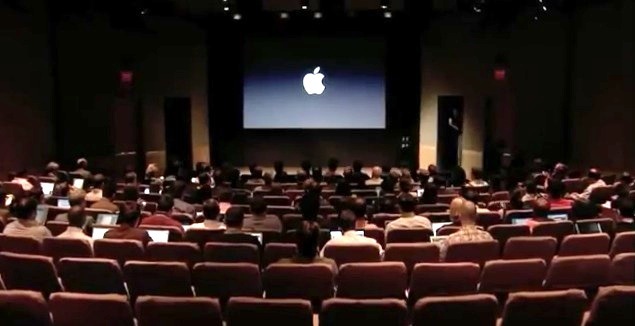 The first two rows, as usual, were occupied by senior Apple executives and employees. Most big corporations employ outside PR agencies. Not Apple. Apple’s internal public relations team is itself a world-class agency. That team was built entirely under Cotton’s leadership.